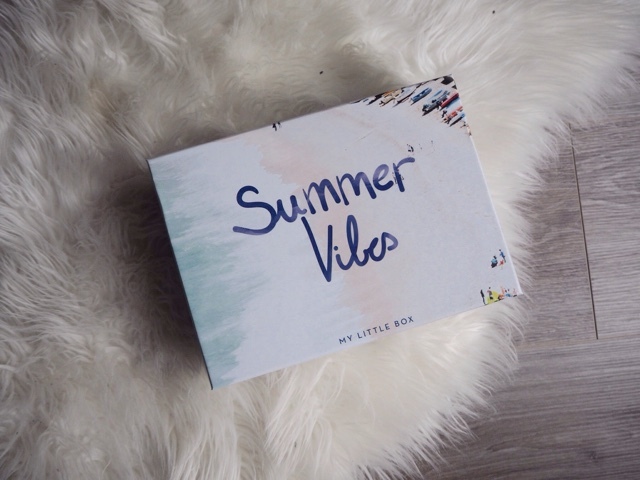 I am starting to get summer ready and although the weather is proving a little trying, I have been determined to feel summery and this month's My Little Box has seriously helped with that. June's theme is Summer Vibes, and it is packed with summer time, festival inspired items that I am so excited to use. As per, there was a mixture of beauty and life style products, as well as the monthly My Little Box magazine. Usually the My Little Box beauty products come in a cute little draw string bag. This month however they came in the cute little waterproof bag that is ideal for storing your bikini in too keep other items in your beach bag dry. It is quite a small bag however so I might use it to store my phone and money ect, in order to stop those products from getting wet. 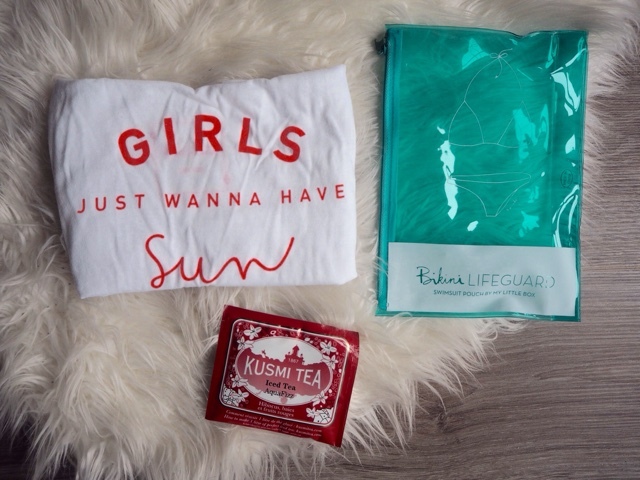 There was also a really cute tank top in the box which is white with orange writing that says Girls Just Wanna Have Sun written across the chest. It is a one size fits all and will be great to pop on over swimwear, tucked into denim shorts, at the gym or even as a top for bed. There was also a sachet of iced tea from Kusmi Tea. I have never really tried iced tea, and being an avid tea drinker you wouldn't have thought that would be the case. So maybe this sample will get me in the mood for the ever so popular summer time drink. I love these little post cars that come in the My Little Boxes. The artwork is so cute and I am starting to build up a bit of a collection. I think that there are so lovely and they really brighten up my desktop at work. 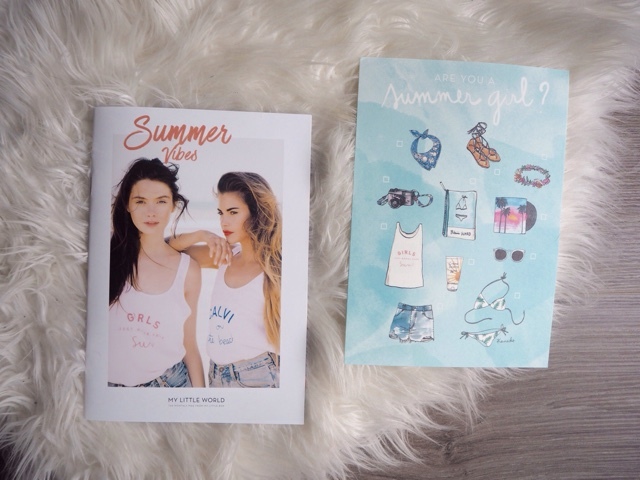 There were three beauty items in this Summer Vibes box and I love each of them. I have already worn the Ciate nail varnish on my fingertips and I fell in love with the colour. It is a beautiful neon coral that looks so flattering on the hands, and is a great colour for summer. I am excited to try the Too Faced Glitter Glue that promises to hold glitter to your eye lids without creasing or wearing off throughout the day. This will be great for me to take to T In The Park as am I sure that there will be plenty of glitter applied that I will want to stay put both day and night. Lastly, there was a sea salt hair spritz from the My Little Beauty range which is the My Little Box's own beauty and make up brand. I love using stuff like this throughout the summer months as it adds a lot of extra texture to your hair, creating a natural, beach waves type of look. Again, this will be perfect for the festival I am going to in a few weeks time. Have you ever tried a My Little Beauty Box? Are you starting to get summer and festival ready?